Some ‘Skin Investigation’ may turn up with unexpected facts! Oops, doesn’t everyone say that skin is the largest organ? That’s why some ‘skin’ investigation is required for ‘skin journalism’. Located a letter to editor in the Journal of Investigative Dermatology that skin is not the largest organ in the body. 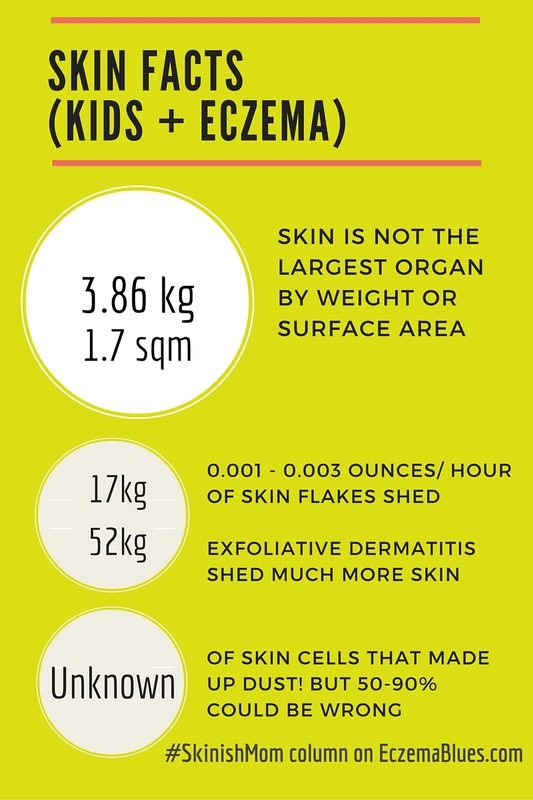 The skin can be considered the largest BY WEIGHT for ‘medium-sized’ organs, excluding musculoskeletal system. From research and as explained by Dr Claudia Aguirre on Quora (Dr Claudia is a featured guest of this blog), humans shed their entire outer layer of skin every 2-4 weeks at the rate of 0.001 — 0.003 ounces of skin flakes every hour. This worked out mathematically to be 17kg to 52kg (or 37 to 115 pounds) for someone who live up to over 70 years old (I’d suppose that the 0.001 to 0.003 ounces is for an average adult, thus strictly speaking, you can’t simply multiply by 70 due to (possibly?) less skin shed for a child (by weight, but given larger surface area to volume ratio, a child may shed ‘more’ skin). Exfoliative Dermatitis – characterized by extensive red skin, followed by skin shedding (similar to life-threatening conditions covered in this blog: Stevens Johnson Syndrome and Erythroderma); the skin shedding is so extensive in these conditions that it affect the normal functioning of the body, in particular temperature regulation and moisture retention, requiring care in hospital. Psoriasis – this condition is marked by only taking 3 to 4 days to mature and does not shed but the skin cells pile up on the skin surface, forming plaques and lesions. Many eczema sufferers reported seeing massive skin shed on the bed and floor but I wonder why the skin cells shed appear so visible (as opposed to normal skin). Found an explanation that the cells on dry skin may stick together, thickening the stratum corneum and when they are shed, it is shed as visible sheets, aka scales. This is another ‘fact’ that could turn out to be a myth – most of the sites state that our dead skin made up anywhere from 50% to 90% of our dust at home. In a study by Layton and Beamer whose study was to find out how much of contaminated soil and outdoor pollutants would get into home dust, it was estimated that about 60% would come from outdoors. Dust is very complicated, with different home, season, surrounding and the type of dust in the air and on the floor being different. It cannot be simplified to state as most of the dust are dead skin cells. There’s sooo much more skin facts to cover, I think we’re good for discovering these till end of the year! Scandinavian Journal of Gastroenterology June 2014 Surface area of the digestive tract – revisited.